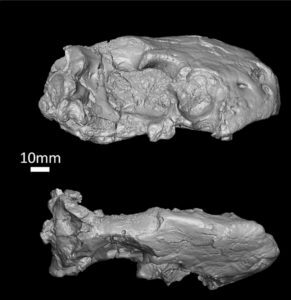 This week a [study] announced a reappraisal (when you examine something again) of an early mammal relative. This animal, a therocephalian, is more closely related to mammals than the dicynodont, Bulbsaurus, we talked about [last week]. A therocephalian, Moschorhinus. From Wikipedia. This animal is called Euchambersia mirabilis. It was thought to have a groove in its canine tooth (the long, pointy tooth). This characteristic lead the original author to think that Euchambersia was venomous. Animals that have venom need to have three things: 1) a gland to produce and store the venom, 2) a transport system to get the venom to the teeth, and 3) a way to make an injury in another animal so that the venom can enter the animal’s body. Figure 1A from the paper showing the CT scan of the skull of Euchambersia. Top is the right side of the skull. Bottom is the top of the skull. Nose is to the right in both images. 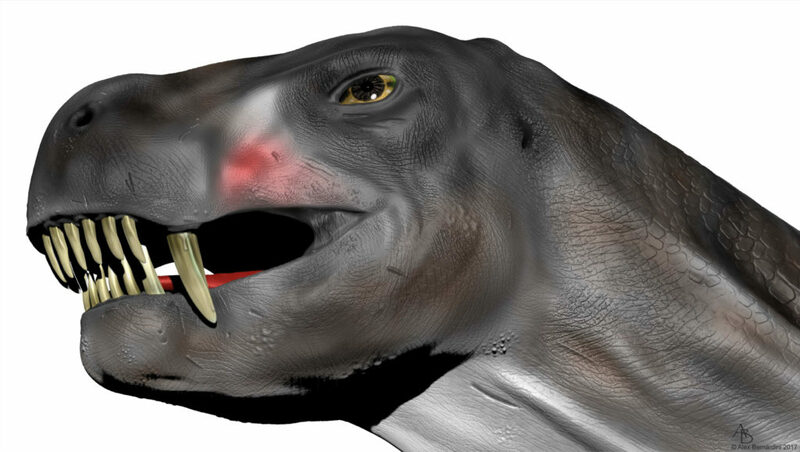 The author’s CT scanned the skull of Euchambersia and compared it to the skulls of three other early mammal relatives and two snakes. They found that Euchambersia has all of the features necessary for venom to be present. It has a depression in its upper jaw, called a maxillary fossa that could have contained the venom glad. There is a canal that links the fossa to the canine and ridged teeth to create wounds. So, even though the authors did not find the groove in the canine described by the original author, the other features in Euchambersia point to it being venomous. A reconstruction of Euchambersia by A. Bernardini, showing the possible location of the venom gland in pink.